In the year that Queen Elizabeth II celebrates her Diamond Jubilee Baldwin’s are delighted to be selling at auction the most British of coin collections. Formed over 34 years by a private collector, the Bentley Collection is the ultimate collection of British gold Sovereigns and is sure to generate interest from collectors and investors alike. 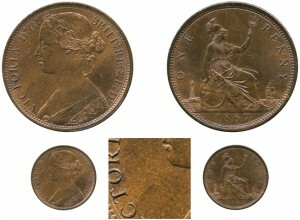 The first of Baldwin’s (www.baldwin.co.uk) two official Coinex auctions will be held on the 28th September this year and will include a spectacular selection of Ancient and British Coins, Military and Commemorative Medals and South African Banknotes, Coins and Medals. Numerous lots in the sale carry some fascinating historical references and are sure to attract a great deal of interest from collectors. Taking place at the CIPFA Conference Centre the auction will be well attended as buyers fly in from around the globe for the Coinex fair arranged by the BNTA. As Baldwin’s celebrated their 25th year of trading in the Orient bidders came out in force to ensure that this pinnacle auction was an outstanding success. The one day sale achieved an amazing, $5,256,675 (including buyer’s premium,) the highest total of any of Baldwin’s sales in the Orient and a fitting result for our 51st auction. "It is magnificent to have achieved such a fantastic result from this sale and the perfect outcome to our 51st auction and our celebration of 25 years in the Orient," Edward Baldwin, Baldwin’s Chairman commented after the sale. Baldwin’s are celebrating their 25th year holding auctions in the Orient this year and this, the 51st auction for the group, is set to be a sale to remember. The sale, which will be held on the 25th August at the Holiday Inn Golden Mile, Kowloon, comprises 1064 lots of far eastern and world coins and banknotes, many with exceptional provenance and of extreme rarity. 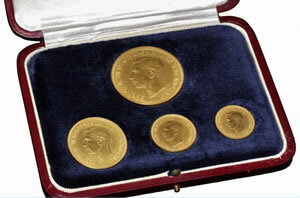 Offered in its original Royal Mint case, a set of four 1937 Gold, Matt Proof finish coins, commissioned to commemorate the Coronation of King George VI, are sure to be the highlight of the Baldwin’s London auction, due to be held in May 2011. Baldwin’s are pleased to announce that this years New York Sale, comprising 1378 lots of Ancient, Islamic & World Coins and Russian Coins, Orders & Medals, will be one of the finest offering from the group so far, including some sensational rarities, fresh to the market.